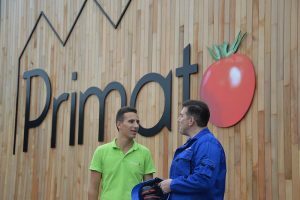 Primato grows tomatoes on a total surface of 125.000 m2. For the powering and heating of their greenhouses, they use a combined heat and power (CHP) installation, driven by INNIO Jenbacher 624 engines. The newly developed Q8 Mahler GR8 was successfully tested in this challenging application and resulted in longer drain intervals, higher efficiency and cleaner engine parts. At Primato, these characteristics resulted in longer drain intervals while important engine parts, like the pistons and combustion chamber, remained remarkably clean. “That is important to maintain the performance and efficiency of the engine”, explains Maltchev. "Ultimately, it’s all about giving our customers the reliability they need for a smooth operation." Interested in how the Q8 Mahler GR8 improves gas engine performance in Primato‘s greenhouses? Watch the video!